New York, NY – (January 10, 2012) The first printing of Alan Robert's critically acclaimed horror graphic novel, Crawl to Me (IDW Publishing), has sold out within a week of its release. As a result, the award-winning publisher is currently scheduling a second pressing. In related news, director David A. Armstrong, cinematographer for the successful box-office hit franchise, Saw, is now attached to direct a live-action adaptation of Crawl to Me for the big screen. Armstrong is currently directing the indie hostage drama, Pawn, starring Michael Chiklis (The Shield, Fantastic Four) and Academy Award winner, Forest Whitaker with Ray Liotta and Common supporting. "The last few weeks have been a whirlwind of excitement, to say the least,” says creator, Robert. “Crawl to Me has already exceeded all of my expectations. Creating comics has been a life-long passion of mine and I’m extremely grateful to be given the chance to tell my crazy stories. To see them come to life on film is a whole other level of awesomeness. I love horror movies, especially the ones with shocking twist endings like The Sixth Sense and The Others, so it's my goal to create that same type of jaw-dropping impact with Crawl to Me." The Crawl to Me graphic novel, written and illustrated by the Life of Agony bassist, collects the four-issue mini-series and boasts a beautifully painted cover by Monocyte artist, Menton3. The book's introduction is written by the legendary Walter Simonson (Thor), who happens to be Robert's former cartooning teacher. 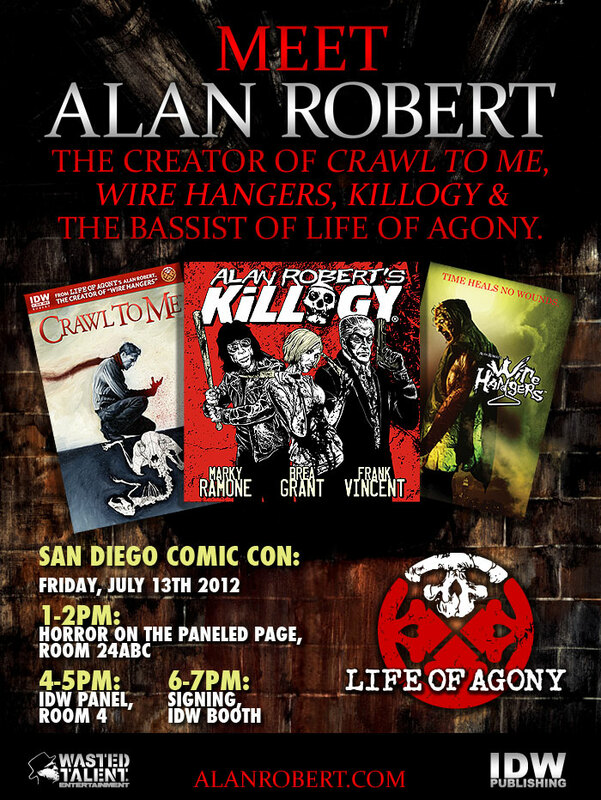 "I knew Alan Robert had juice with his Wire Hangers series, and Crawl to Me is even more of a singular creator's vision come to life,” said Chris Ryall, Chief Creative Officer / Editor-in-Chief for IDW Publishing. “To then see that graphic novel get voted Best Mini-Series of the Year by horror fans at ComicMonsters.com and now sell out its initial press run is very gratifying and appreciated. Even more, it speaks to the market for more unique comics amidst a world of superhero relaunches and big licensed comics." Alan Robert's "Crawl to Me" (IDW Publishing) won the "Best Mini-Series of the Year" award, as voted by fans on ComicMonsters.com. ComicMonsters.com is the largest horror comic book news site in the world and part of the Horror News Network. Winning this award was a great achievement for "Crawl to Me" creator and Life of Agony bassist, Alan Robert, considering the respected competitors in the category. The nominees included, best-selling author, Joe Hill's "Locke & Key: Keys to the Kingdom", Mike Mignola's "Hellboy: The Fury", "American Vampire: Survival of the Fittest", and the extremely popular zombies/war series, "68", among others. In related news, Robert recently guest-starred on the Season Two premiere of TLC's hit show, NY Ink, where he went under the needle by the show's lead female tattoo artist, Megan Massacre. The segment focused on Robert's life-long passion for creating comic books and how his twenty-year long, successful music career actually gave him time to hone his craft. The tattoo in which Megan inked on his leg was based on the cover artwork from Robert's "Crawl to Me" graphic novel, in stores January 2012 (click here to purchase) originally painted by Menton3 (Monocyte, Silent Hill). The episode, "Kings of NY" will air again on TLC, Thursday January 5, 2012 at 8PM ET/PT. LIFE OF AGONY BASSIST/COMIC BOOK CREATOR - ALAN ROBERT GUEST STARS ON THE SEASON TWO PREMIERE OF TLC'S HIT SERIES "NY INK"
New York, NY – (December 20, 2011) - New York native - Alan Robert, best known for being the primary-songwriter/bassist for the respected hard rock group, Life of Agony, and most recently as the creator of the hit comic series’- Crawl To Me and Wire Hangers (IDW Publishing), guest stars on the Season Two premiere of TLC’s NY INK on Thursday, December 29 at 9 PM ET/PT. The show’s star — Ami James, along with the rest of the Wooster Street Social Club crew, have welcomed celebrity guests into their shop before. Last season, Corey Taylor (lead vocalist of Slipknot and Stone Sour), Method Man (actor and rapper of the Wu-Tang Clan), LaMarr Woodley (linebacker for the Pittsburgh Steelers) and fashion designer, Robert Vaughn (Von Dutch) all got inked at Wooster St. and told their tattoo stories. On the upcoming Season Two premiere, titled “Kings of NY”, the show kicks off with Robert going under the needle by the program’s female standout tattoo artist — Megan Massacre. 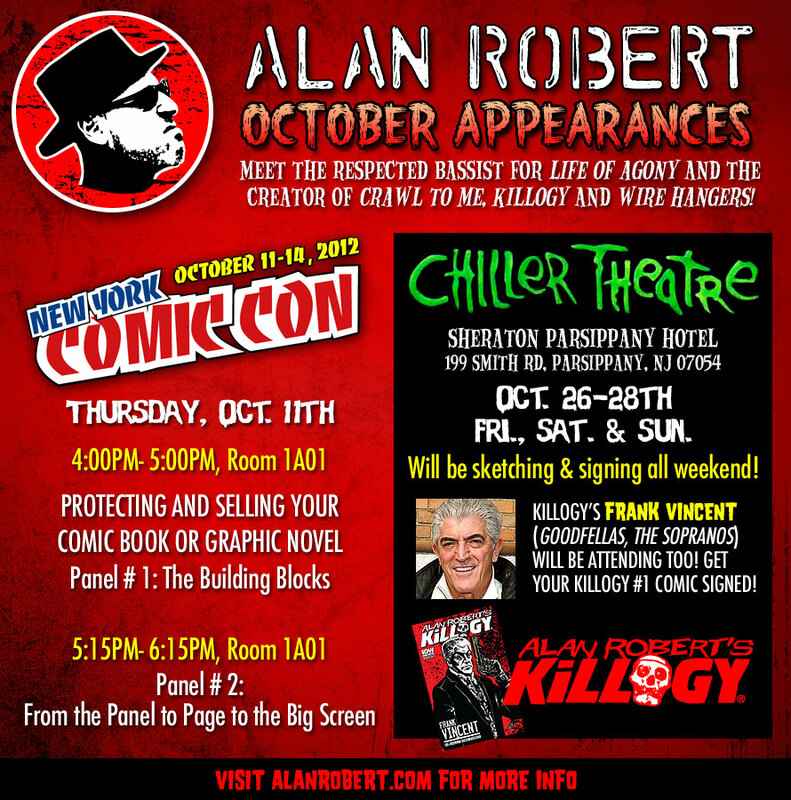 About Alan Robert: Ain't It Cool News called Alan Robert’s Crawl To Me horror comic series "Gorgeous & Terrifying!" Fangoria said, "Readers will be blown away by the story and artwork of this psychological thriller." Crawl To Me received universal praise in the media and as a result, a feature film is now in the works with David A. Armstrong (SAW franchise) attached as the director. The compiled Crawl To Me (IDW Publishing) graphic novel hits fine bookstores everywhere in January 2012. Robert’s first comic series, Wire Hangers, also in development to become a feature film, was published in 2010 by IDW. Created, written & illustrated by Robert, the series received the "Cover of the Year" award by ComícMonsters.com, beating out popular books such as Vampíra and Aliens Vs. Predator. Robert is best known for being the primary-songwriter and bassist of the hard-rock group Life of Agony. He studied cartooning under Walt Simonson (The Mighty Thor) at The School of Visual Arts in New York City. He attended SVA on scholarship and graduated with a Bachelor of Fine Arts. Life of Agony quickly made a name for themselves in the mid-nineties after releasing several albums through Roadrunner Records. The band continues to tour extensively throughout the world and has performed with the biggest names in rock, including Metallica, The Red Hot Chili Peppers, and Ozzy Osbourne. The group has headlined music festivals as large as 500,000 people in Europe and their music videos have aired all over the globe. The band developed a cult following and signed to major label, Epic Records/Sony in 2005. The group released its fourth studio album, "Broken Valley", with lead single, "Love to Let You Down” which was nominated for a MTV2 Video of the Year Award. Life of Agony went on to sell over one million albums to date. In 2007, Robert formed a NY-based punk-trio, Spoiler NYC, which he fronts. The group released their debut album, “Grease Fire in Hell’s Kitchen” (SOS Records) and toured to support it. The group recently posted two new songs produced by Grammy award-winning producer, Ken Lewis (Lenny Kravitz, Fall Out Boy, Beastie Boys) while they complete the recording of their follow-up album, “Banned in 38 States”. Visit http://www.alanrobert.com for more information. TLC is a global brand that celebrates extraordinary people and relatable life moments through innovative nonfiction programming. A top 10 cable network for women, TLC has built successful franchises around the Cake Boss and Say Yes to the Dress brands. In the first half of 2011, TLC had 23 series averaging 1.0 million viewers or more including Extreme Couponing, Sister Wives, 19 Kids and Counting, What Not To Wear, and NY Ink. TLC is available in more than 99 million homes in the US and 75 million households in 34 countries internationally. A destination online, TLC.com offers in-depth fan sites, exclusive video content, and original editorial covering style, home, food, and more. Fans can also interact with TLC via On Demand services, on mobile platforms, including an iPhone App, and through social media such as Facebook or @TLC on Twitter. TLC is part of Discovery Communications (NASDAQ: DISCA, DISCB, DISCK), the world's number one nonfiction media company reaching more than 1.5 billion cumulative subscribers in over 210 countries and territories.